Sofec's CALM terminal will be installed in 650 foot water depth off Trengganu, West Malaysia. figuration, will readily accommodate the large vertical buoy displacements in the relatively shallow water location. The terminal is connected to shore by four 18-inch submarine lines, handling crude oil, ballast water, naptha, fuel oil, kerosene, and/or diesel oil. A major engineering effort went toward reducing maintenance and facilitating field repairs which may be periodically required. All inspection and lubrication ports are easily accessible. Other features include: — The 72-inch main bearing handling mooring loads, fully enclosed in a machined steel housing; multiple Teflon® seals exclude seawater and other contaminants. This mod- ular unit can be repaired or replaced on location. The three turntable roller assem- blies are also fully sealed. — The product swivel assembly is com- pletely segregated from mooring loads, does not require lubrication, and may be fully maintained on location. — In addition, the chain stoppers are at- tached above water and do not require divers for attachment or inspection. The chains can be vertically tensioned. Free literature is available completely de- scribing the Sofec CALM marine terminal. Inc. Capt. Charles Renick (left), director of the Acad- emy's Office of External Affairs, looks on. The grant helps support midshipman activities which receive no federal funds. The grant helps further midshipman pro- grams and activities at the academy which are not federally funded. Among such pro- grams are intercollegiate athletics, the sail- ing squadron, the band, a concert and lec- ture series, and a student loan program. The check was presented to academy su- perintendent Rear Adm. Thomas A. King by Capt. Thomas W. Merrell, a 1947 acad- emy graduate who is currently the super- intendent of Texaco's marine operations department. 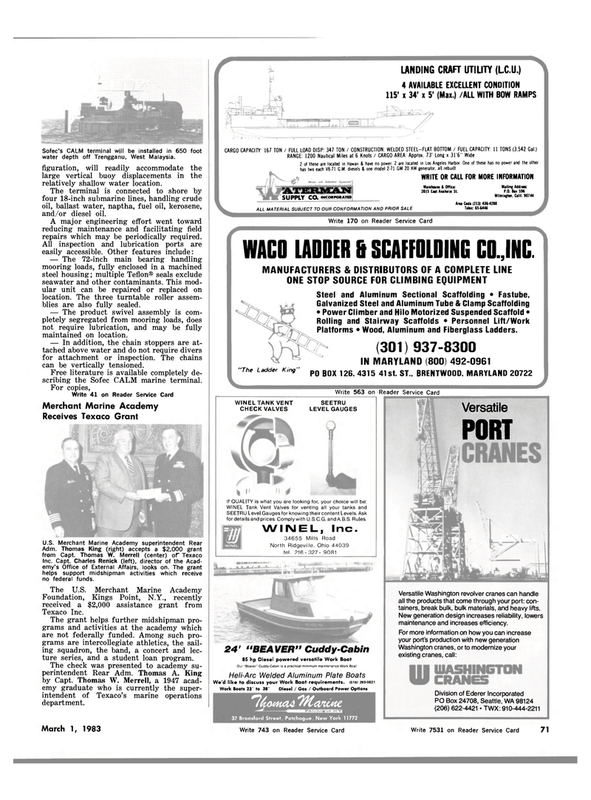 WACO LADDER & SCAFFOLDING CO.,INC. SEETRU Level Gauges for knowing their content Levels. Ask for details and prices. Comply with U. S.C.G. and A B.S. Rules. Our "Beaver" Cuddy-Cabin is a practical minimum maintenance Work Boat. Versatile Washington revolver cranes can handle all the products that come through your port: con- tainers, break bulk, bulk materials, and heavy lifts. New generation design increases reliability, lowers maintenance and increases efficiency.